Speaker of the House, Rt. Hon. 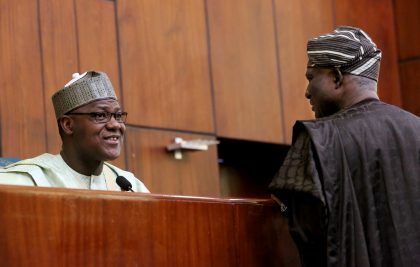 Yakubu Dogara presided. He said opening prayers and approved votes and proceedings for Wednesday, February 7, 2018. Hon. Barde, while moving the motion, said that while the Attorney General of the Federation and Minister of Justice, EFCC and CCT are indispensable in the fight against corruption in Nigeria, the recent turn of events (with the CCT Chairman, Danladi Umar being charged on two counts of corruption) calls for concern. He expresses deep concern that the AGF and EFCC, who have brought these charges against the CCT chairman, are also currently prosecuting cases before him. Hon. Barde added that although the EFCC had previously issued a statement absolving Justice Danladi Umar of any wrongdoing, charging him now and asking him to try SP Bukola Saraki gives the impression that a game is being arranged to meet a predetermined result. He said that by so doing, the justice system is being portrayed as susceptible to manipulation and this should greatly worry every well meaning Nigerian. He further went on to add that given the circumstances, any possible convictions or findings which the CCT may make may therefore be rendered null and void by the Court of Appeal, thereby frustrating the course of justice. He also described as disturbing, the fact that the AGF seems to be instrumental in this “unwholesome saga”. 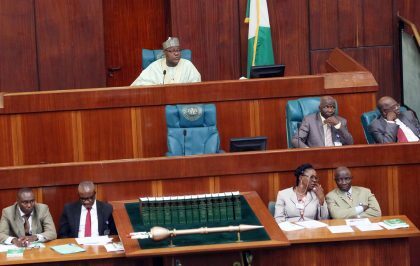 The motion was adopted and the House resolved to condemn the manipulation of the legal system by the AGF and the Ag. Chairman of the EFFC, and mandate the House Committee on Judiciary to interact with the AGF to ensure that sanity is brought back to the case at hand. Hon. Sunday Marshal Katung also moved a motion of urgent public importance, seeking the inclusion of Kaduna and Plateau states in the states affected by the farmer/herdsmen clashes, and listed for visitation by the panel constituted by the NEC. He called on Members to support the motion, saying that: “this is yet another opportunity to show Nigerians that we truly care about them.” He gave a brief narrative of clashes from 1980 to date, with attendant loss of lives and destruction of property. While contributing to the debate, Hon. Jagaba Adams Jagaba stated that the farmer/herdsman crisis began in Southern Kaduna. He said that one of the biggest farmers in the area was killed only last week after being trailed for a while. “In this country, we have to do things in such a way that everyone has a sense of belonging. The number of people killed in Southern Kaduna is three times those killed in Benue, but in our own case, we don’t have a voice. Come 2019, we have decided that the voter’s card is our AK47. We are going to vote out people that are insensitive to our security”, he said. Hon. Mohammed Sani Abdu also supported the motion and corroborated Hon. Jagaba’s narration of the crisis beginning in Southern Kaduna. The motion was put to a vote by Speaker Dogara and the ayes had it. The House then went into the first business of the day. House Leader, Hon. 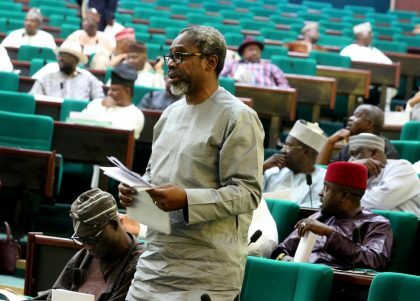 Femi Gbajabiamila led debate on A Bill for an Act to Provide that 20% of Jobs Available in all Federal Government Ministries, Departments and Agencies and Companies be Distributed among the Physically Challenged Persons in Nigeria; and for Related Matters (HB. 1261). He said that the bill seeks to do what should have been done a long time ago for fellow Nigerians, as it would ensure that People with disabilities are able to live optimally. He said that if passed, it would be a landmark legislation in line with the Constitutional provision against discrimination. He further stated that the essence of the Bill is to “give equal opportunity to all and sundry” and explained that the Bill stipulates that the person with disabilities who will benefit from the affirmative action would also have to be qualified for the positions being offered. Hon. Kannike contributed to the debate, saying he supported the “spirit and intent” of the Leader @femigbaja in sponsoring the bill, as people with disabilities have been ignored for too long as is evident in the structure and design of public facilities. 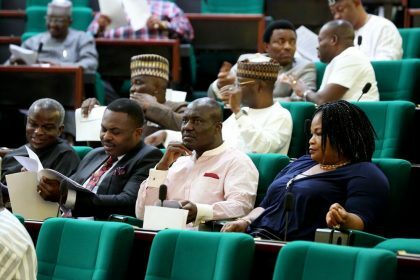 He, however, also raised concerns about statistical provisions contained in the Bill and queried whether the percentage of people with disabilities in Nigeria corresponds to the 20% being recommended. Hon. Abdussamad Dasuki also joined the debate, saying that the term “disability” must be clearly defined as he recently saw recruitment adverts from the Nigerian Police which listed “bow legs” as a form of disability. Hon. Ogene Egoh also said that people with disabilities have suffered a lot in Nigeria and called on all Members to support the Bill. He also echoed concerns about the statistical provision of the Bill. Hon. Aminu Shagari, who clarified that the proper term is “people with disabilities” and not “physically challenged people”, suggested that instead of “companies”, the Armed Forces could be made to have a quota for people with disabilities in certain departments. Hon. Betty Apiafi raised concerns about enforcement. Speaker Dogara put the question and the ayes had it. The Clerk read the long title and the Bill was referred to the Committee on Labour, Employment and Productivity. The House passed through second reading, A Bill for an Act to Establish Federal University of Agriculture, Kabba to make Comprehensive Provisions for its due Management and Administration; and for Related Matters (HB. 1259) (Senate) (Leader). The Bill was referred to the Committee of the Whole. The House passed through second reading, A Bill for an Act to Amend the Federal Colleges of Education Act, Cap. F8, Laws of the Federation of Nigeria, 2004 to align the Colleges of Education affected by Boundary Adjustments as a Result of States Creation and to Establish Federal College of Education, Malam Madori, Jigawa State to Address the Current Imbalance in the Establishment and Distribution of Federal Institutions in the State; and for Related Matters (HB. 1260)(Senate) (Leader). The Bill was referred to the Committee of the Whole. The House also passed through second reading, A Bill for an Act to Establish Federal College of Education, Jama’Are Bauchi State to Provide fulltime Courses, Teaching Instruction and Training in Technology, Applied Science, Arts, Social Sciences, Humanities and Management; and for Related Matters (HB. 1216) (Hon. Isa H. Mohammed). The Bill was referred to the Committee on Tertiary Education and Services. Also call on the Ministry to expedite work on the Second Niger Bridge project to relieve the pains and sufferings of Nigerians plying the First Niger Bridge. financial improprieties at the Bank of Industry from 2010 to 2015, including the Management of the Bank on the sales of overN40 billion of its shares in WAMPCO Nig. Plc without due process, its equity holdings in Dangote Properties and also the properties that had been declared missing; and procedures followed in the of hiring of four (4) Executive Directors without the approval of the President of Nigeria. Urgent Need to Investigate Alleged Diversion of Funds Appropriated for the Power Sector and Apparent Disregard of Due Process in the Awards of Power Projects. Set up and adhoc committee to investigate the alleged diversion of funds appropriated for the power sector and the apparent disregard of due process in the awards of power projects, and report back in six (6) weeks for further legislative action. (ii) Mandate the Committee on Customs and Excise to interface with the Management of the Nigeria Customs Service with a view to ascertaining whether its financial operations are in line with financial regulations and also investigate the unwarranted killings and shooting of people which are causing fear among the populace, and report back in eight (8) weeks for further legislative action. Mandate the Committee on Aviation to liaise with the Federal Ministry of Transportation to revisit the airport project that was planned for Ekiti State and ensure its early completion to boost the economic, social and tourism potentials of the State. A Bill for an Act to Establish the Institute of Chartered Biochemists and Molecular Biologists charged with Responsibilities to, among other things, Determine the Standard of Knowledge and Skills to be attained by persons seeking to become registered Biochemists and Molecular Biologists, Register such Persons, Regulate and Control their Practice and Review those Standards from time to time, as Circumstances may Permit; and for Related Matters (HB.1142) (Leader) (Committee of the Whole: 2/11/2017). Plenary was adjourned at 2:20 p.m., until 11 a.m. on Tuesday, February 13, 2018.